Some people believe that it is okay to hold off on getting dental work, especially if they aren't feeling any pain or discomfort. In reality, postponing restorations can harm your teeth and oral health, allowing minor problems to turn into major – and majorly expensive – issues. If you want to enjoy healthy teeth that will last a lifetime, you shouldn't put off any dental procedures. Ignoring tooth decay will ultimately lead to more tooth decay. The enamel doesn't repair itself, and cavities can easily spread if they aren't treated immediately. When you treat a cavity right away, you prevent the spread of decay and can also preserve even more of your original tooth structure. With white filling options, others won't even know that you have a filling unless you tell them. Alternatively, if you ignore a cavity, a more serious condition may develop. The decay may travel into the inner portions of the tooth, affecting the nerve roots. This can cause intense pain, especially when you chew or eat cold and hot foods. With decay and bacteria running rampant in the pulp, you may need a root canal to properly treat the problem, and a dental crown might be required to further protect the tooth. There are many reasons that people choose to put off getting dental work done. It is possible that you feel that dental treatment is scary or that you believe your schedule is too busy to accommodate a dental visit. However, the longer that you wait for dental treatment, then the more complicated your procedure will be. 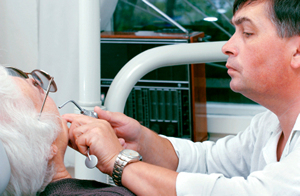 Your regular dental evaluations are another thing that you should never put off. Give our office a call to set up your next appointment.